Ten years ago a man broke into the KHM (art history museum) and stole a salt and pepper shaker called Saliera. I had never heard about this thing before the theft and haven’t really thought about it in the last couple of years. 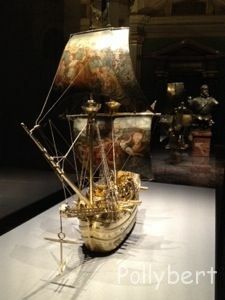 But since I had bought a yearly pass for the KHM which is actually running out today, my friend Tici and I decided right after the Lucian Freud exhibition to go and see the Kunstkammer (treasure chamber) before the pass expired. And there we also saw the now famous Saliera. 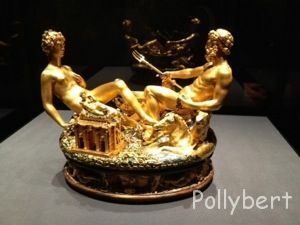 Of course the Saliera is not the only treasure which we saw at the museum. We strolled leisurely through it and I took a couple of pictures. 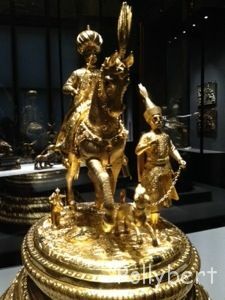 It is really amazing what the Habsburgs amassed during their reign of Austria. It gives me great pleasure that all of this belongs to a museum now for everyone to see. The loss of youth is shown very realistically. The sagging breasts and the receding hair are nothing really to look forward to but the only alternative would be to die young. And who wants to do this? Here a couple of more treasures that would also look good at my place. More adoring glances at the ceiling and some former heroes. art, Austria, culture, Europe, exhibtion, museum, traveling Austria, Vienna. Bookmark.